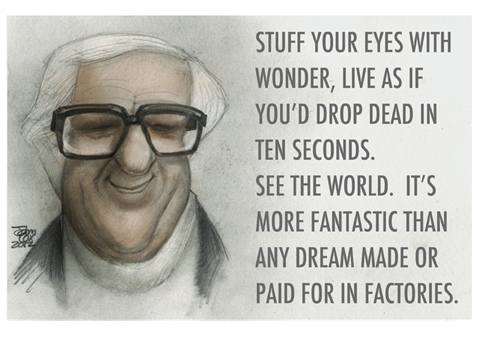 Science fiction giant, Ray Bradbury (1920-2012) will remain a platinum standard of highly thoughtful and entertaining stories that reveled in our shortcomings yet burnished our desire to redeem humankind. Thanks John.I was hoping you'd do something on this. If you want to live long and prosper, that's exactly what you do. And, "prosper" doesn't necessarily mean piles of money. ... & I had never really noticed--aside from the hair--how much Ray Bradbury & Phil Silvers favored each other, especially in their later years. YWHS to Yo (Yo, you popped in after I opened the page & posted before I hit "send"--I had to leave my PC for a moment). This page contains a single entry from the blog posted on June 8, 2012 12:11 AM.